Allergan had organized a symposium titled “The changing focus of glaucoma care” on 29th March 2018. The event was held at the Hyatt Regency Hotel, Kota Kinabalu, Malaysia. As the chairperson, I had the opportunity to introduce the speakers and manage the proceedings of the symposium. There were 2 invited speakers : (1) Dr Suresh Subramaniam from Hospital Permaisuri Raja Bainun, Ipoh, Malaysia (2) Dr Peter Kong, who runs the Dr Peter Kong Eye Specialist Centre in Kota Kinabalu. Dr Suresh presented 2 talks. 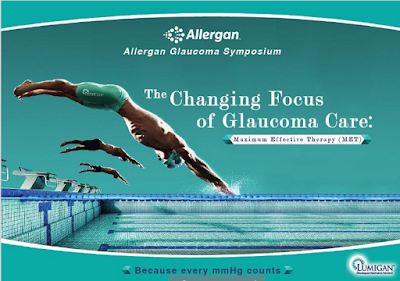 The first was on maximal effective therapy (MET) and the second on prostaglandins in glaucoma therapy. Maximal effective therapy centers on 3 points: (1) Every mmHg of IOP reduction counts. Early, effective therapy can bring down IOP and reduce the slope of VF progression. (2) IOP targets have to be individualized to ensure optimal therapy to slow the rate of VF progression. (3) The adherence/efficacy challenge. What makes a patient less likely to achieve the target IOP and how can we address these factors? Compliance is a serious issue in glaucoma management. A number of PGs are now available for glaucoma therapy. It may become difficult for Ophthalmologists to decide which PG is the best for their patients. In this regard 4 factors can help to differentiate among various agents. These include: (1) Mode of action (2) Preservative (3) Efficacy (4) Cost. Lumigan (bimatoprost) is a prostamide and distinct from prostaglandin analogues in that it has dual trabecular as well as uveoscleral outflow mechanisms. It also has a SUCRA value of 100%, indicating its extreme effectiveness in reducing IOP compared to PGs. Dr Peter Kong presented a few of his cases where he implanted Allergan’s Xen gel stent. Most of his patients had good IOP control either as a stand-alone procedure or after the addition of an IOP lowering agent. I appreciate this type of activities for prevention of glaucoma. We should raise public awareness against this dangerous disease. I used vision plans provided by DentalSave to treat any eye disease by specialist dentists with discount expenses.